Home Basketball LeBron goes out to cut the rumor: did he choose his All Star team to take them to the Lakers? LeBron goes out to cut the rumor: did he choose his All Star team to take them to the Lakers? 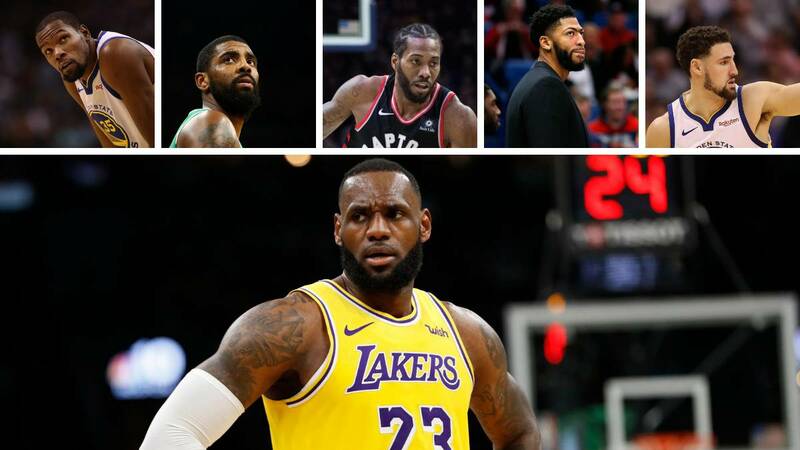 After taking four of the six players that will go to free agency (plus Anthony Davis) the issue has been the talk in the NBA in recent days. Kevin Durant, Kyrie Irving, Kawhi Leonard and Klay Thompson. What do these four players have in common? They are going to go out to free agency this summer and they will play in Team LeBron in the Match of the Stars next Sunday. All thanks to the King who chose them early on Thursday when they split him and and Giannis Antetokounmpo to the rest of All Stars. From that moment has not stopped circulating the rumor that LeBron did it as a gesture to, in the future, have one more argument to convince them to sign for Lakers. Not all of them, obviously, because there is not enough salary space, but some of them. In addition, is joined by Anthony Davis, who also chose and with whom we all know what has happened in recent weeks. So yesterday, after the training of the Angelenos, journalists asked him about all this. "I think it's a great topic of conversation, guys who are restricted free agents, free agents, with the option of a player ... It's part of the speculation that continues to drive our sport," joked LeBron, then became more serious: "Yo I chose according to the draft I had made and the best player available at any time: . He happened to have Durant, who is a free agent, and Kyrie, who is also a free agent, Harden is under contract and Kawhi is an agent free ". About that supposed strategy that followed also explained the first steps:" I knew what I was going to do with my first and my second choice because Giannis had already said that I was going to catch Curry first, so I knew that I was going to I started with Durant and Kyrie. He changed my pace a bit when he chose Embiid and I had to change my strategy, but I like my team. " Durant was just asked what he thought LeBron had chosen him as the first of all possible players for the two years. The response of the Warriors was great: " What else could I do? " The other two players who will be this summer to free agency and will not play in the LeBron team are Khris Middleton and Nikola Vucevic. With the one who will play for the last time is with Dwyane Wade. "I can not believe I'm going to play another All-Star Game with Wade, my least favorite person in the world." (Laughter) No, it's going to be special, that's for sure, it's your last hoorah (Marines battle cry) and being part of that moment will be a pleasure. "